Hi, everyone! I’m so excited to give you a little look inside the inspiration behind our December collection. This adorable assortment is super special to all of us on the design team as it was inspired by so many lovely memories and sentiments wrapped up into this idea of the perfect cozy winter afternoon. Snow falling outside. A warm and cozy fireplace inside. Playing games … drinking hot cocoa … just being together. Every piece in the collection is super easy – easy to wear, easy to match, easy to love. That goes for girls and baby as well as tween and women. Everything feels really good on – and that was really important to us. We want her to feel comfortable in this collection – for it to be something she wants to reach for again and again all the way ’til spring. In addition to apparel, this assortment also has some really fun surprises too. We’re introducing a small collection of toys! These were all passion projects for the design team – things from our own or our girls’ childhood that we wanted to bring to life for your MJ gals to have and hopefully just love and love. We can’t wait for you to see everything else in the new collection – it all arrives tomorrow, December 1! 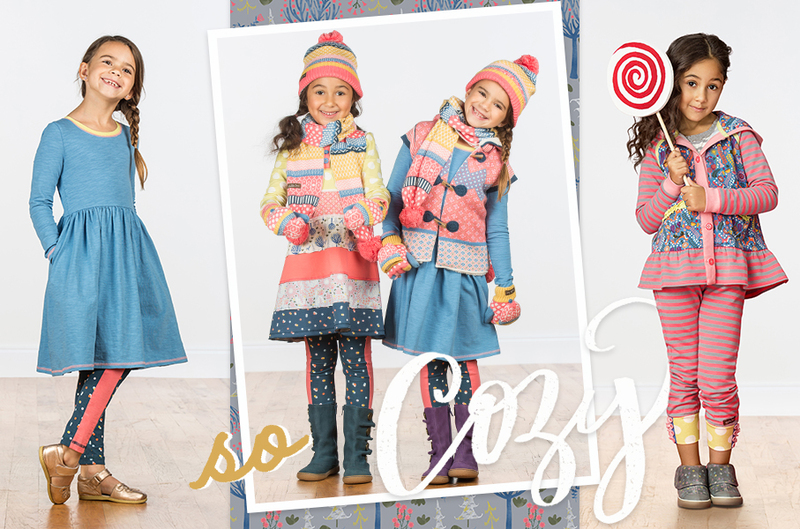 We hope you find a few special pieces that speak to you, that your girls will just fall in love with and just feel good and comfy and cozy this winter. Obsessed w all things MJ for years. I want every aspect of my life to be all MJ!!! My daughter,her daughter,and myself had matching tops about 2 or 3 years ago and from MJ …we loved them and hope to find more this season. I am anxious to see the line! One of my daughters first dresses (throwing it way back to 2010-11) was the wendy from Field Trip & Hammond Bay. The funky mix of paneled fabrics was the best! I cant wait to get my hands on this piece for my 8 year old!!!! We love everything you guys create! 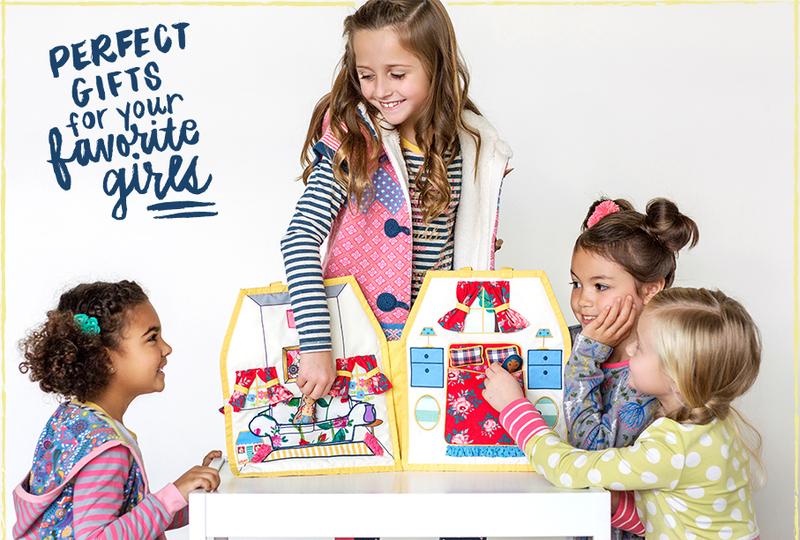 We can’t wait for those adorable dolls! So excited for tomorrow!!! This just might be one of our favorite days of the year! Giving Tuesday is near and dear to our hearts, as giving is really what this unpredictable little company is all about. As a community, Matilda Jane works with a purpose: to bring happiness into the lives of the customers we adore and to Spread the Love to others as far as we can reach. Whether it’s a special note in an order or volunteering in our community, we live to make people smile. Even before I had the pleasure of working at this amazing brand that she built, I remember our founder, Denise DeMarchis, blogging about just how excited she was about spreading a little cheer and MJC love to as many as she could with enough sparkly trees and presents to cover the floor. Boy, did she know how to make a girl, family, friend, and even someone she has never met feel special, and we want to pass that along to you and those in your life! So, here is how it all works … Spread the Love is where we get YOU, our sweet customers, involved in our giving as well. Ready to make someone’s day? Well, all you need to do is to send a little something about this special person who might need a surprise or a little pick me up, and if they are chosen WE will take care of all the legwork. Simple as that! Spread the Love is our way to continue this amazing opportunity to brighten someone’s day or just be the perfect surprise to begin or end a week. The more we grow, the more we want to continue to give back and spread the MJC love wherever we can, from our own backyards to halfway around the world. From the very beginning, we wanted this company to make dreams come true. To Spread the Love. And to make the world a little better place, any way we could. We love that you help us through your nominations and donating your time, talent, and more. You all are truly AMAZING! So, because it is Giving Tuesday, we thought we would extend our deadline to our holiday Spread the Love nominations to see if we can reach just a few more families this season. Be sure to get the following information about your nominee(s) sent to spreadthelove@matildajaneclothing.com by this Friday, December 1. 1. Include the full shipping address and name(s). If you don’t know the names, please state unknown. 2. Please include the ages and sizes of your nominees. 3. If you know something they really would love, let us know that as well! 4. Once you have all this information, please email us at spreadthelove@matildajaneclothing.com. Please put all this information in one single email. Have a fabulous week and the happiest of holidays to you! I just submitted my nomination!!! Thank you for all that you do!! If it’s possible, we love MJC even more than before!!!! Thank you so much for your kindness! I just submitted my nomination. I’d like to nominate my mother. My whole life I have watched my mom go without so others can get things they want. She is always putting others before herself. She is always helping me afford Matilda Jane for myself and my toddler daughter. And because she’s always going out of her way to help me as my family one income family of five. So since she is always offering to help me afford it for my daughter and myself, she isn’t buying it for herself. I was able to talk her into buying one piece for herself this summer when I hosted a Jane gives back show in honor of my son’s rare chromosome syndrome called Potocki- Lupski Syndrome. So thanks again for spreading the love in June with Jane gives back and my show was able to send over $300 to my son’s syndrome’s foundation. I said I didn’t need anything that month so she bought herself her first piece. She was so excited and she couldn’t believe how comfortable and soft it was. She wore it a lot this summer and I know she would be honored to own more Matilda Jane. I would like to nominate my dear friend Joey, and his little girl Kimber Jane. They dearly love Matilda Jane, and are your biggest fans. They truly deserve it, and would be glad to share their story with you. What a Precious thought!! I am already seeing the smiles on those cute little faces.. Loved it! Thank you MJC for this amazing opportunity to share the love with those we love. It has been an amazing year sharing with friends about the twirl that MJC offers to everyone. Joyce is my mom and I nominate her because she was diagnosed with a rare and aggressive form of breast cancer this summer. She had a double mastectomy immediately and is now undergoing chemotherapy. She lost her job and had to move my stepdad who has Alzheimer’s into a group home. She is currently living with us and I see on a daily basis the toll all of this is taking on her. I know she would be surprised to receive anything in size XXL and she would love it. Thank you for considering her. Isabel is my 6 year old daughter. She has been in a wheelchair for the last month as she undergoes treatment for clubfoot. It has been challenging for her to adjust to not being able to move like a six year old should be able to. She wears size 8 in most items and would love anything. Thank you!